As more and more Michigan parents seize opportunities to select a school, most of them say they’re glad they did. Those high levels of satisfaction should make it clear that choice is here to stay. Some families are content with the public school in their hometown. But others have determined that one or more of their kids needs a better environment or educational fit. There are many debates about choice and charter schools at the Legislature and in the media, but the views of parents who benefit from these options are often missing from the conversation. The group of choice parents also gave high marks to their newly chosen schools. Half rated their school an A, and 30 percent, a B. Earlier this year, the Mackinac Center went straight to the source. We worked with a Lansing polling firm to find and interview more than 800 Michigan parents who exercise public school choice. This group represents a rough cross section of parents, based on race and income. One-fourth were African-American and one-fourth earned less than $25,000 a year. The eye-opening results should color public conversations about these programs that serve thousands of families. The current education system long has enabled families with a sufficient income to shop for a home in a neighborhood that grants entry to specific local public schools. But for more than two decades, the state also has opened doors to additional public school options that don’t require getting a new address. Increasing numbers of parents are taking advantage of these options to serve their children’s educational needs. Nearly one in four Michigan public school students today attends a school outside the district assigned to their home ZIP code. Most Michigan students who exercise choice use one of two forms. First, many students, particularly in low-income and urban areas, have enrolled in one of the state’s 300 charter schools. These independently governed public schools, accountable to parents and to a contract with an authorizing agency such as a state university, must take in all students who apply, as long as there is room. Even more Michigan students are transferring to a traditional public school outside one offered by their district. Since 1996, the state’s Schools of Choice law has made it easy for students to enroll in another district. Under the law, state money goes with the student to the new public school. Local districts decide whether they will participate and how many students they will receive. Inter-district choice is increasingly popular and is used by all types of families in nearly all parts of the state. Schools of Choice students are more likely to be poor and minority than the typical Michigan public school student. In many cases, exercising choice is not a one-time decision. Most of these same disadvantaged students don’t stick with their new location for a long time. Three out of five kids who start kindergarten in Schools of Choice leave the program by fifth grade. As for the other form of school choice, researchers have found that attending a Michigan charter school results, on average, in extra months of measurable learning. An earlier Mackinac Center report found that students using Schools of Choice tend to transfer to higher-achieving districts, but an extensive study by Michigan State University could not find any learning gains through the program. 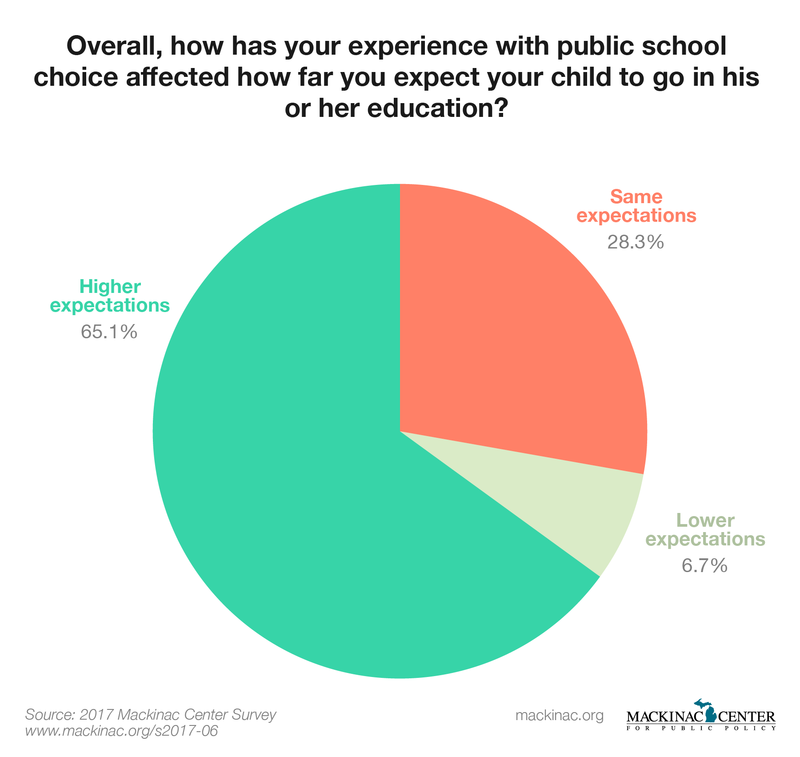 Looking at this messy picture, the Mackinac Center saw the need to ask parents why and how they made a choice, and what it has meant for them. In all, 68 percent said their decision to transfer was motivated primarily by a need to boost a child’s academic performance or to attend a school with a different type of academic program or educational philosophy. One in 10 respondents said that school safety or disciplinary concerns drove them to choose. One question, more than any other, revealed what parents seek from their children’s schooling. Nearly two-thirds said their experience with public school choice has raised their expectations of how far their child will go in his or her education. Even a higher percentage of African-American and low-income parents thought so. The group of choice parents also gave high marks to their newly chosen schools. Half rated their school an A, and 30 percent, a B. That 80 percent satisfaction rate is significantly greater than the results from national surveys of all public school parents. It’s also helpful to understand how parents reached their decisions, given the available options. About 30 percent said their decisions were most informed by conversations with other parents, while 18 percent relied on websites with school performance data. It isn’t clear how many more parents would make use of objective data if it were widely available. There’s much still to learn by listening to parents who choose. Education leaders should use these first answers to help them make attractive learning options available for even more families.